One of the benefits of living where it snows, or taking a trip to snow with your dog, is watching a joyful dog frolic in it. But why does snow elicit such a response? Well, Scientific American has taken the time to ask a bunch of experts that question. I suspect that part of the answer lies in how quickly dogs habituate to objects that they play with. Snow changes the sensory characteristics of everything it touches — visual appearance, obviously, but also, and perhaps more importantly, scent. Thus snow has the potential to renew a dog's interest in its (over-?) familiar surroundings, and switch on exploratory behaviour. My dogs both do find the snow to be the bee's knees, as have all my dogs — at least until the icy patches form between their toes. The question of 'why' is a bit imponderable, but if I must ponder I'd say that here, dogs might be more like us than we'd expect: there is a pleasure in a changed landscape, a topography re-shaped by fallen snow. Dogs like the 'new', of course, and what could be more new than their entire world covered with this icy blanket. Smell is changed, too, and we can for a moment see some of the otherwise invisible markings (like tracks or urine) which are so engaging for dogs. More than anything, I suspect that the very sensation of snow on the body is engaging for dogs. Have you ever run through the shallow waves of the sea? Why does kicking up sand and seawater make us happy? I can't say. But it is clear that it does. Dogs like snow because it is cool and different. When we do enrichment for dogs, we provide individual items to increase variety in their environment. Kongs with peanut butter and kibble in paper bags provide a change from the everyday. Snow changes everything: what a dog sees, smells, hears and feels as it runs/swims through the snow. Knee-deep snow is up to a dog's chin. When I watch dogs run and play in snow, it reminds me of kids in a ball pit, diving in and burrowing and having a blast. 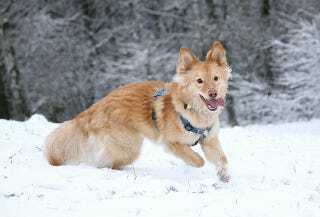 Seasoned sled dogs rarely show the enthusiasm for fresh snow typical of novice players. This suggests that the value of novelty is critical. Just as they do for the dog visiting the beach for the first time, the joys of opportunity and exploration abound for the virgin snow dog. Read the rest of the theories at Scientific American.